WHITE PLAINS, N.Y. –The state of New York opened its first hydrogen station to support Chevrolet’s Project Driveway, an effort to move fuel cell technology from the laboratory into people’s driveways. White Plains Mayor Joseph Delfino and Phil Baxley, president of Shell Hydrogen LLC, dedicated the state’s first hydrogen vehicle refueling facility today at the city’s Department of Public Works depot. The White Plains fueling station is the first of six hydrogen vehicle refueling stations planned for the U.S., as part of the U.S. Department of Energy’s Infrastructure Demonstration and Validation Project. As part of a comprehensive deployment plan called “Project Driveway,” Chevrolet will supply more than 100 Chevrolet Equinox Fuel Cell electric compact SUVs to private and commercial customers in New York (Westchester County and metropolitan New York), Los Angeles and Washington, D.C. Customers will test-drive the vehicles for a time frame of between three and 30 months beginning early next year. The White Plains DPW depot is located in a convenient and central location for Project Driveway customers wishing to refuel their Chevy Equinox Fuel Cell electric vehicles in Westchester County. The commercial fueling station is located in a gated lot to effectively control entry and exit. The facility will manufacture and store 30 kilograms of gaseous hydrogen from water using CO 2-free hydropower provided by the New York Power Authority. Because the hydrogen is made onsite, there will be no added fuel deliveries to the site. Chevrolet will pay for the fuel that the Project Driveway test drivers will use while documenting their experience with the vehicle. “The City of White Plains has shown real leadership in cooperating on this project with Shell. White Plains’ successful track record in introducing alternative fuels for city vehicles is a great fit with Shell Hydrogen’s efforts to develop solutions to transportation and energy challenges,” said Baxley. “This station is another step toward an eventual network of stations serving our customers here in the U.S. and around the world." The city of White Plains was recognized by the Department of Energy as the first “ Clean City” in the state of New York, and has been at the forefront in using alternative-fueled vehicles and increasing the efficiency of its vehicle fleets. "The opportunity for the City of White Plains to partner with Shell Hydrogen to create this hydrogen fueling station is very exciting. It enables White Plains to continue research and demonstration programming for alternate fuels, for which we are recognized throughout the Northeastern region,” said Delfino. “If everyone contributes a little of their time, talent and resources, as is the case in this project, we can surely make a difference in making our air a little cleaner without compromising the use of the automotive transportation system." During the past several months, thousands of interested drivers visited Chevrolet’s website or contacted local Chevrolet dealers to see if they lived in a Project Driveway study area. Eligible drivers had to be at least 21 years of age, with good driving records. Participants will provide regular, candid feedback about their use of the vehicle in their daily lives, the vehicle’s performance and their personal preferences. GM is demonstrating its commitment to electrically driven vehicles – whether the source of the electricity comes from a lithium-ion battery or a hydrogen fuel cell – as the answer for helping take the automobile out of the environmental debate and reducing our dependence on petroleum. The zero-emissions Chevrolet Equinox Fuel Cell SUV is powered by GM’s fourth-generation fuel cell propulsion system and meets all applicable 2007 U.S. Federal Motor Vehicle Safety Standards. The vehicle includes a range of safety features found on other Chevrolet cars, including driver and front passenger air bags, anti-lock brakes, and GM's OnStar telematics service, which will offer drivers advice on operating the cars as well as information on nearby hydrogen filling stations. 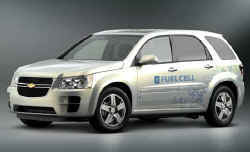 The EPA has certified the hydrogen-powered Equinox Fuel Cell as a zero-emission vehicle (ZEV).